Product prices and availability are accurate as of 2019-04-15 11:51:38 UTC and are subject to change. Any price and availability information displayed on http://www.amazon.com/ at the time of purchase will apply to the purchase of this product. A great way to keep countertop, table tops, or desktops organized and clear while adding a touch of personal style. 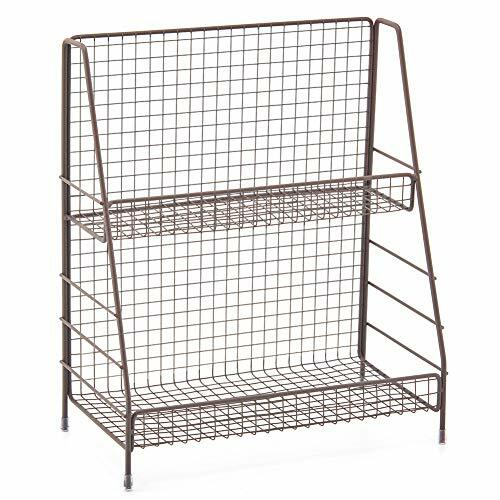 The organizer offers 2 wire basket shelves with a leaning design to easily access bottom or top shelf items. A multi functional design that can complement most room decor while offering storage space for a wide variety of items. 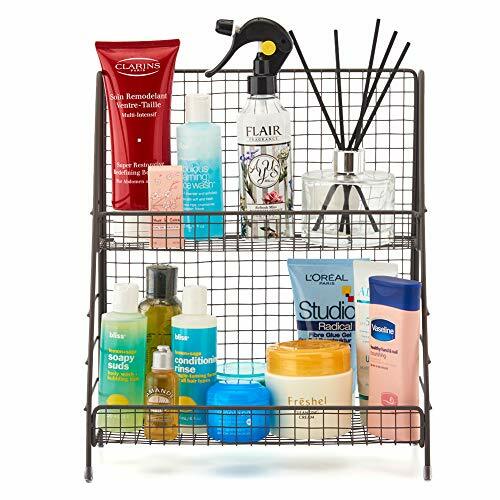 Perfect to store kitchen spices and seasonings, bath & beauty essentials, crafting supplies, display small figurine, nail polishes & more. Full metal frame with light brown enamel. Neutral color scheme and design to match most home decor style. Rubber grip feet to ensure it does not scratch, slide, or slip of countertops. Free-standing, solid build that will not tip over or fall. Requires zero assembling or installation. 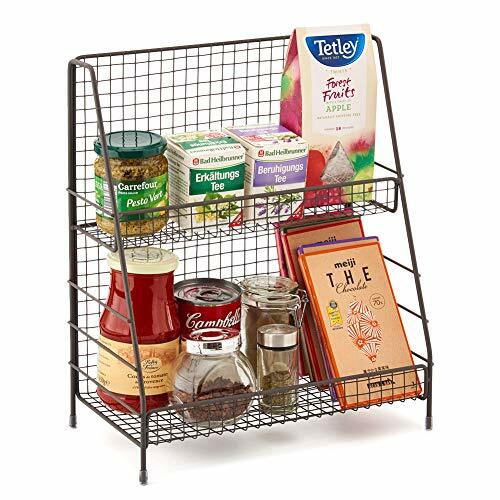 [ HOME & KITCHEN ORGANIZER ]: EZOWare 2 Tier Spice Rack Kitchen Organizer provides a fashionable and space saving storage solution to organize and declutter the majority of glass or plastic bottles, jars, stationary, skin / beauty products and other smaller items in your home. [ ANTI SLIP ]: Includes 4 non-scratch rubber pad feet to protect table and prevent the organizer from sliding. 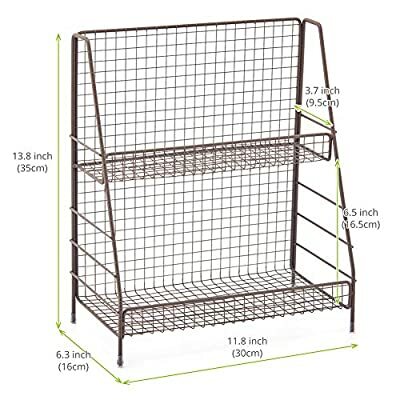 [ EASY ACCESS ]: Top shelf measures 11.8" L x 3.7" D, Bottom shelf measures 11.8" L x 6.3" D x 6.5" H. Two shelves with different depths make it easy to find, access, or place your items. Please note: Rack only, pictured props and jars are NOT included. [ DURABLE ]: Constructed of durable metal with a rustic brown finish, the organizer has a stable hold for the items. 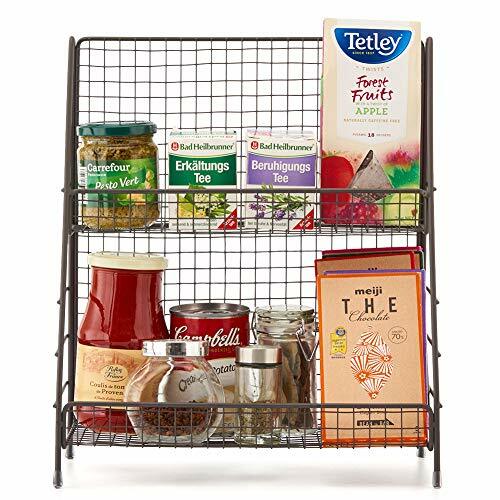 Perfect to store and display your spice jars, seasoning containers, salt & pepper grinders, small teapots, loose tea leaf, dry goods, small herbs, snacks, or beauty care products like skin care, cleanser, makeup, nail polish, hair brush, and more. [ MULTI-FUNCTIONAL ]: Maximizes your storage space! 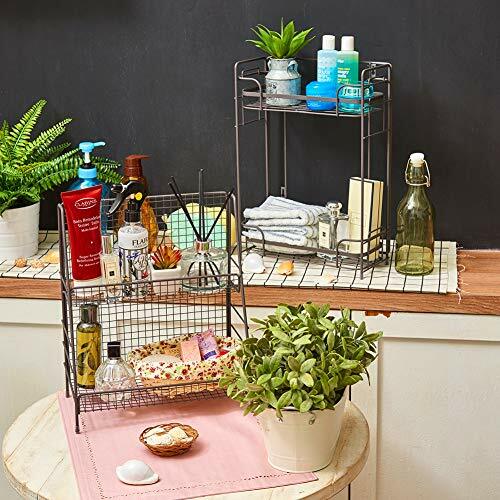 Utilizes it in any place of the house, including bathroom, cabinet, coffee table, kitchen countertop, pantry, craft room, living room, shelves, and more.